Apple acquired Silk Labs, an AI startup with significant tech pedigree, whose tagline is to "embed instant cognition into your next product". We have to respect the science fiction marketing, of course. But we also respect that the machine learning solutions from this company allow machine vision, sound recognition and natural language processing to be done locally on a particular device. That means that a specific device that you use for conversational interface interaction will be locally better at understanding you -- rather than some giant squid-like monster AI hosted on Amazon Web Services. And of all the tech companies, Apple is the most credible in its claim to protect your privacy on the iPhone, with such an acquisition potentially powering other edge-computing / Internet of Things products. Edge computing is the concept that there are lots of unique distributed smart devices scattered throughout our physical world, each needing to communicate with other humans and devices. Two layers of this are very familiar to us: (1) the phone and (2) the home. Apple has become a laggard in artificial intelligence -- behind Google on the phone, and behind Amazon and Google at home -- over the last several years. Further, when looking at core machine learning research, Facebook and Google lead the way. Google's assistant is the smartest and most adaptable, leveraging the company's expertise in search intent to divine meaning. 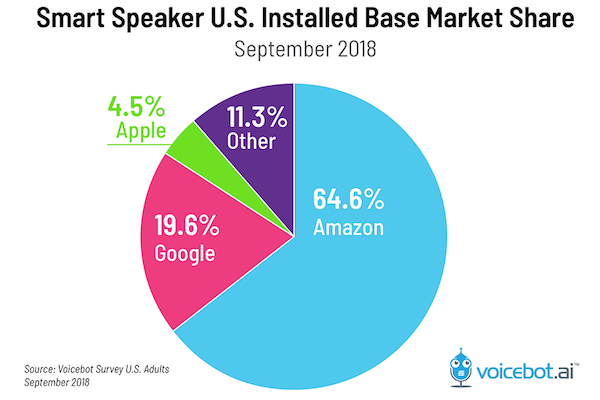 Amazon's Alexa has a lead in physical presence, and thus customer development, as well as its attachment to voice commerce. Facebook is expert in vision and speech, owning the content channels for both (e.g., Instagram, Messenger). We also see (3) the car as developing warzone for tech company gadgets. Looking back at financial services, it's hard to find a large financial technology provider -- save for maybe IBM -- that can compete for human attention or precision of conversation with the big tech firms (not to mention the Chinese techs). We do see many interesting symptoms, previously covered in our Augmented Finance analysis, like AllianceBernstein building an AI-based virtual assistant for bond traders, but barely any compete for a relationship with a human being in their regular life. The US is fertile ground for this stuff, because a regulated moat protects financial data from the tech companies. Is there room for a physical hardware financial assistant in your home? How much of your financial life would you delegate to some*thing* that decides how you should live it?